On a desk buried by campaign ads, the one on top contains a helpful reminder. Much of the campaign propaganda raining down on us now is based on distortion and falsehood. Now and then there’s a useful exception. 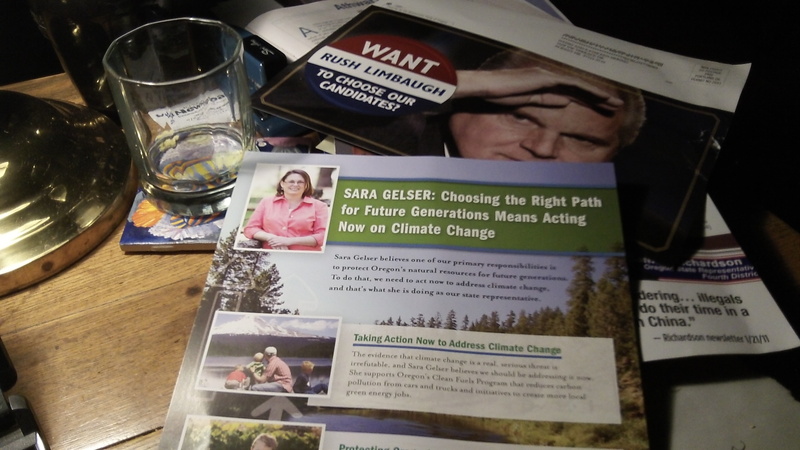 A newly arrived mail piece, for example, has just reminded us that, unfortunately, one mid-valley candidate favors a state program to make motor fuel more expensive. Democrats in the 2009 legislature enacted this program, which requires the fuel industry first to report the “carbon intensity” of gasoline and diesel and then to reduce it by 10 percent over 10 years. The program has a sunset or ending date in 2015, and the legislature has twice refused to remove that date. Governor Kitzhaber nevertheless directed the Department of Environmental Quality to go ahead and launch the program’s second phase, the carbon-reduction requirement. The idea is to encourage the Oregon development of ethanol and biodiesel, and the only way that can be done is to make traditional fuels more expensive than they otherwise would be. This is the supporters’ approach to subsidizing an industry that can’t seem to prosper on its own. Through lower mileage and higher food costs (as ethanol is made from corn), we are already paying for bad fuel policy because the law requires gas to contain 10 percent ethanol. Unless it is allowed to die as scheduled, the clean fuels law will have us make do with even less efficient fuel while paying even more. So if you won’t say it , I will. Don’t vote for Gelser–vote for Close to protect us from the local nut case. Just curious HH (or anyone who thinks Gelser’s support of this policy disqualifies her for public office): Are you saying that Anthropogenic Global Warming isn’t real? It is real, but we shouldn’t do anything about it? We should do something about it, but without government involvement? We should do something about it, but not at the Oregon state level? Or the state should address global warming, but this fuel policy isn’t a cost-effective way to address the state’s contribution? Mr Hering, at least Close has some respect for the 2nd Amendment. Gelser is from the Bloomberg school of gun confiscation & restriction. In my view the Demos of this beginning century are sure leaning to becoming the “new” communists of this century. Socialism is only good for a classroom study. Not for a practical political system. Why aren’t we making fuel out of Hemp, like we should be? Climate change exists and has for tens of thousands of years. Same is true for solar and geologic processes that are beyond the scope of human re-direction. Carbon taxes are advertised as the solution, but where does the money go? The money goes into “initiatives” managed by consultants and agencies appointed by elected officials. Anyone want to dig a little and see if Cylvia Hayes has her mitts on the redistribution of taxpayer dollars to her preferred vendors? That is after all what advisers do. We’d all be better off if we managed our forest resources more responsibly and get serious about creating jobs; providing renewable building materials, taking a cut of the profits to fund public safety and our schools. Let’s not forget all those young trees that will gobble up all that CO2 as they grow into truly sustainable forests. Betsy Close isn’t going to be indebted to anyone but her constituents. Sara on the other hand would be obligated to her billionaire benefactors at the expense of our future.